Boil cauliflower until mushy (or cook in pressure cooker for 8 minutes and do a quick release). Add the cauliflower to your blender with the non-dairy milk, garlic, miso paste, lemon juice, pepper, and salt. Blend until silky smooth. Set aside. In a large pot, boil pasta according to package directions. One minute before pasta is ready, add chopped spinach into the pot. When the pasta is al dente, strain pasta/spinach well. 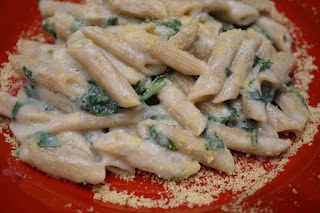 Return pasta and spinach to pot. Add Garlicky Cauliflower "Cream" Sauce and cook for 3-5 minutes over medium low heat. Serve with vegan parmesan cheese.